How do I add files to a workspace? To add files to your workspace, upload them from your desktop or mobile device. You can upload any type of file. You can upload any number of files, but each file must be no more than 2GB. The following section describes how to add a file from the Documents Dashboard. 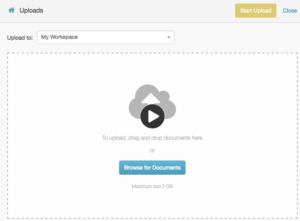 Find the workspace to which you want to upload files and click the upload button. Select the files. You can drag and drop a file onto the page, or you can click Browse for Documents. To give a file a different name before you upload it, type over its original name. To assign tags to a file, type a term in the Tags box. Similar tag names appear. Select an existing tag or create a tag. You can add as many tags as you want. For more information, see About content tags. Note: To add more files, click Add More Documents. A progress indicator appears for each file. To return to the workspace, click Close. To share an uploaded file, click the share link. For more about sharing a file, see About sharing files. For more about how to replace a file, see Upload a new version of a file. To add files to a workspace, you can also use the Upload Files button, which appears on several pages in Documents. Select the files. You can drag and drop a file onto the screen or you can click Browse for Documents. To assign tags to a file, start typing a tag in the Tags box. Similar tag names appear. Either select an existing tag or type a new one. You can add as many tags as you want. For more information, see About content tags. Click Start Upload. PureCloud displays the progress of each file. For more information about sharing files, see About sharing files. For information on how to listen to call recordings, see Listen to recordings.